Adopted August 20th, 1960 the flag of Senegal serves as the national flag and naval ensign for the country. In 1959, France melded Senegal together with the French Soudan to form the Mali Federation, which had a flag strikingly similar to this one, except with a stylized depiction of a human being in the center instead of a star. The Union between the two colonies didn't last long after independence and the two split to form Senegal and Mali. But for reasons passing understanding, they removed the sun and just went with the plain white stripe and haven't changed it sense. Unlike Senegal's flag, which has permutations upon permutations of meaning, Nigeria keeps it simple, The green stripes represent Nigeria's natural wealth, and the white stripe represents peace. But what Nigeria lacks in symbolic complexity, they more than make up for with a plethora of variant flags including ensigns for their Air Force and Navy along with State and Civil Ensigns. They've also got flags for the President of Nigeria, the President as Commander in Chief of the armed forces, another Naval Ensign, a flag for the Nigerian Defence forces and the former flag of the President along with oodles of historical flags. 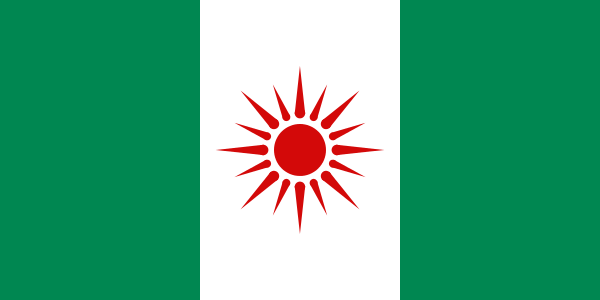 I could probably do a whole series of posts on the many many flags of Nigeria- but if you want to check 'em out, get over to to the flag's Wiki-Page and check 'em out. The Tricolor that started them all, France has one of the most iconic flags in the world today as well as a flag with an incredibly complex history. Originally adopted with the colors reversed in 1790 the design was tweaked and the current order of blue-white-red was adopted in 1794. The Royal Flag came back after Napoleon for the Bourbon restoration of 1815-1830 but after the July Revolution of 1830, it's been the Triocolor ever since. The symbolism gets a bit muddled as well. The historical roots seem to be well-established: the Paris Militia wore cockades of red and blue when they stormed the Bastille in 1789 and Lafayette added a white stripe to the cockade to 'nationalize' the design a bit and break up the revolutionary colors somewhat- though many identified the white with being associated with the Monarchy and some people assumed the red and white were a reference to the red and white livery of the Duc d'Orleans. As factionalism began to grow in the first revolutionary period, monarchists started flying white flags and Jacobins and Socialists red ones and the combination of the two colors with the blue came to be seen as a symbol to transcend factional fight and represent France itself. Or, if you want the official government version: white stood for the King, while blue and red were the colors of Paris. (Another one sentence explanation: blue is for liberte, white for egalite and red for fraternite incorporating all three elements of the revolutionary motto.) If you want to do a deep dive into the history of the Tricolor, head over to the flag's Wiki-Page and jump down the rabbit hole. Thus ends our first trifecta of countries bound for Russia 2018 next year... we'll be off next week for the holiday, but back the first Saturday of December to tackle the next trifecta: Colombia, Belgium and Switzerland. Until next time, keep your flags flying- FREAK or otherwise!